The western is a genre that hasn’t had a huge amount of joy in recent years, and as a big fan of the genre, I feel a certain obligation to try and catch any film that falls into that category. 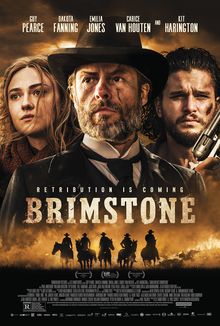 ‘Brimstone’ is the latest to hit a small number of cinemas, and it’s the story of a mute women (Dakota Fanning) who is hunted down by a vengeful preacher (Guy Pearce), for reasons which will become clear over the course of the narrative. The film is the creation of Dutch director Martin Koolhoven, and it marks his first foray into English language features, and I’d say the end result is a bit of a mixed bag. The opening section introduces us to Liz (Fanning) and her family, who live a quiet existence in the old west until a new reverend arrives in town and a series of horrific events start to occur, leading to Liz and her children fleeing the area. The story is told in 4 sections (labelled biblically) and told in reverse order for the most part, which is a smart (if slightly confusing) choice to withhold some of the secrets hidden in the narrative regards why our protagonist is constantly running from the preacher. Dakota Fanning is a good, young actress and she’s solid here, and I enjoyed seeing ‘Game of Thrones’ Kit Harington and Carice Van Houten pop up in smaller parts, but it’s Guy Pearce’s antagonist who dominates every moment he’s on screen. His preacher is a genuinely frightening villain, and I’d be surprised if he wasn’t influenced in part at least by Robert Mitchum’s preacher in Charles Laughton’s underrated ‘The Night of the Hunter’, with his mere presence (whether on screen or not far off it) creating a huge amount of tension. On the negative side, I felt that ‘Brimstone’ was too long, incredibly bleak and the catharsis is minimal, when it does come. This is a film about an evil man, who we learn is evil from very early on, and we continually get reminders throughout as he does more and more despicable things. It’s fairly relentless and despite Guy Pearce’s chilling portrayal, it veers into exploitation at times. It did get under my skin though and it’s a film that has stayed with me, which I’ll always consider a positive trait.